Requires purchase of Viscera Cleanup Detail or Shadow Warrior (2013) to acquire. Vert- but the FOV is highly adjustable. 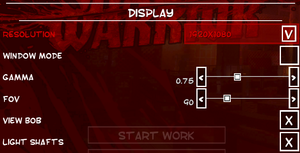 Between 80° and 160°; use Flawless Widescreen for higher settings. Master, music, effects, ambient. See Separate volume controls. Speech is present but there is no in-game option. Modify the value in SoundGroupVolumes=(Group="Voice",Volume=1.000000) under [RSGCore.RSConfig_Sound] to your desired value. 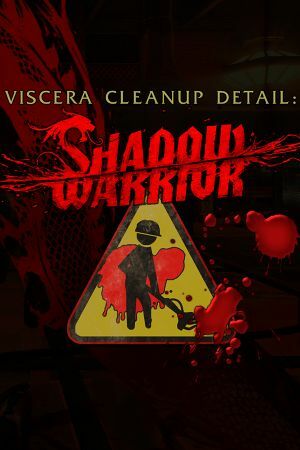 Use Helix Mod: Viscera Cleanup Detail. ↑ 2.0 2.1 File/folder structure within this directory reflects the path(s) listed for Windows and/or Steam game data (use Wine regedit to access Windows registry paths). Games with Steam Cloud support may store data in ~/.steam/steam/userdata/<user-id>/255520/ in addition to or instead of this directory. The app ID (255520) may differ in some cases. Treat backslashes as forward slashes. See the glossary page for details.